Bathing your pet puppy is the most significant component of its grooming routine. Here are a few essentials for the beginners. Don’t forget to put them in a handy place before preparing for bathing. Brushing your Yorkie hair before bath helps in detangling and removing extra hair. Place a mat or towel close to your bathtub to avoid slipping. The water level in the tub should not be over half of Yorkie’s body. Water temperature should be warm. Put cotton swabs in Yorkie’s ear to keep them dry. 1. Before taking your dog for bathing, brush its coat gently to remove tangles and knots. 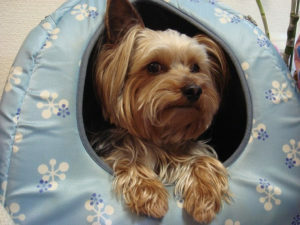 You can spray Yorkie’s coat with a leave-in conditioner to avoid hair breakage. 2. Put cotton swabs in Yorkie’s ear, because water can remain in the ear and can cause infection. 3. Now, pour Luke-warm water gently onto Yorkie. Massage shampoo in the circular motion all over the body. This can cause tangles but proves to be best for cleaning. 4. Rinse the shampoo with combing motion using your fingers. Do not leave any residue of shampoo; it can cause irritation and dryness. Wipe out the area around eyes and face with a wet sponge. 5. Squeeze gently the excessive water from Yorkie’s hair and apply oil-based cream conditioner on its body. After bathing and drying your dog with a towel, thoroughly brush and comb your dog to remove tangles. If necessary, you can trim your dog’s hair and clip its nails. If you are not comfortable doing it on your own, you may hire the services of a professional groomer. Bathe your dog more often if you have allergy problems.